Kit 1 is the necklace in the centre of the picture. Using Lurex 4ply, the tube is knitted and beads are inserted when the tube is complete. The kit includes 10yds lurex, 9 beads for insertion. 11 seperator beads and instructions. 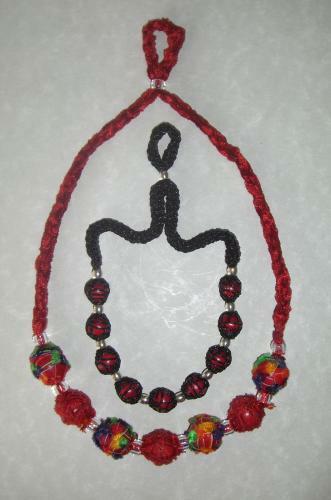 The instructions are also given for alternating colours of yarn and beads (outside necklace). Required - Knitting Nancy spool, scissors, crochet hook (pref. 2.5mm) and PVA glue.